Hi folks. I've got a set of Snowflake wheels from a 280zx. 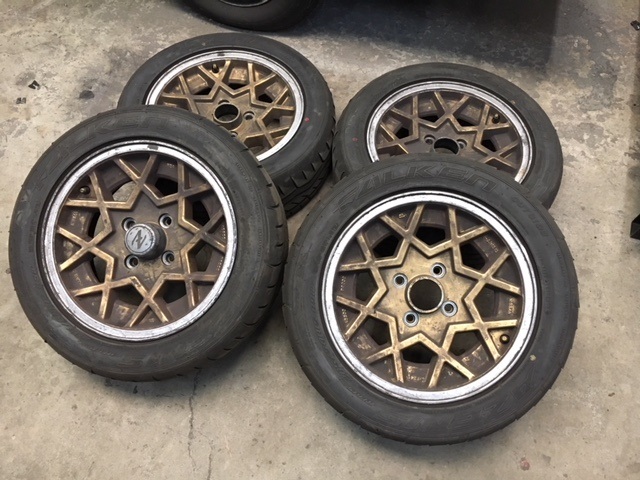 We've been using these on our LeMons race car but have moved to wider rims. As you can see, they are dirty and with gold painted centers. These are not pristine rims, but they are round and straight. Daily driver, not show quality by any means. Tires are Falken Azenis 615k but they are pretty much history. $200/set OBO. Would prefer not to ship. I'm in the San Francisco Bay Area. Reducing price to $150. Let's get these puppies sold and rockin' on somebody else's car!!! These wheels still available ? Ignition Problem: Car tries to crank in "ACC" and "On" mode, but shuts off at "Start"